NHL 15 wasn't very good. EA Sports released a hockey game that was obviously hamstrung by the launch of the new generation of consoles, and it arrived missing modes entirely and playing poorly compared to previous years. You have to realize, the NHL series went on like a decade long streak of being one of the best annual sports games released. Ever since the introduction of the analog sticks for stick control, the game has been on a tear of adding high quality features to its docket. Last year saw the drop of the EASHL and gameplay that felt like skating in mud. For NHL 16, EA brought in members of the community throughout the development process to make sure they made a game hockey fans were excited to play. The EASHL is back, and the new set of features and tweaked gameplay make this year's entry much better. It's a return to form, folks. What an improvement. Year over year, it can be hard to identify the exact changes in finite gameplay between sporting games in the same line. Take Madden for instance. This year's game is fantastic, and the actual on-field gameplay has been changed with completely new throwing and receiving mechanics. Even with that, though, the way the game feels is largely the same. NHL 15 felt terrible. Players felt way too heavy, and the game itself felt far too slow. NHL 16 is noticeably better. There are still some oddities in regards to shooting and puck control (some players keep it on a string while others have a hard time simply deking side to side). The overall experience? Smooth as butter. Faceoffs feel better, skating actually feels like moving on edge, checking has been improved and the AI seems to respond much better to how you play on the ice. Teammates move to open ice during breakouts instead of skating in straight lines, and the result is a game that feels much more dynamic. That translates to the actual presentation and arenas themselves. Graphically, the game looks better than last year. The players, animations and smoothness all feels more new generation. The live action announcers before games look great, though the audio commentary can be repetitive. The one liners especially feel tired, though a few new ones sneak in every now and again. The game actually features mascots for the first time ever. It sounds stupid, but you'll actually see Iceberg, the Penguins mascot, bang a drum to rally the crowd during play. I'm not talking about in cutscenes, I mean during actual play. The camera is far enough out to see some fans up against the glass. There's Iceberg in the corner, doing mascot things. 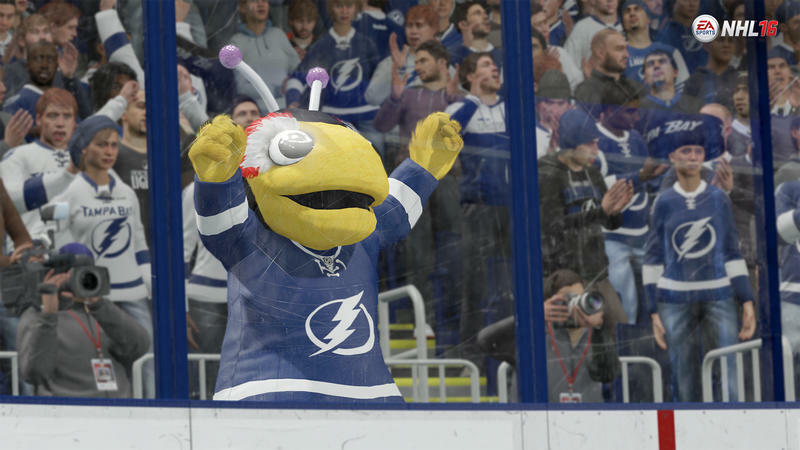 The inclusion of mascots is so small and silly, but it does wonders to up the presentation style of NHL 16. The arenas feel more alive thanks to the mascots and crazy playoff towel waving, and that's great for the high intensity feel of hockey. When you take a shot on the net, the camera zooms in slightly. If you actually score, that slight zoom coupled with the visual explosion of the crowd firing off their seats does wonders for drama, and it's just one of the many ways that this game feels more lively than ever before. The best news I have for fans of this series is the return of missing modes. NHL 15 saw the drop of the EA Sports Hockey League. It's back. You can create and join clubs and compete in up-to six on six hockey in dynamic seasons. Online Team Play is here from the start, as are online shootouts, season mode, GM mode and a whole lot more. Be A GM in NHL 15 was stripped down to bare parts. It's been beefed back up. Last year's game didn't even offer a season mode, but it's back in full form with a really, really good trading system. The whole game feels beefier than before, though it's missing some newer modes that other sports games from EA offer. I'll talk about that in a bit. Look, I felt downright bummed about NHL 15. The game was missing so much content that I loved diving into every single year. NHL used to carry me throughout the entire hockey season, and I couldn't even make it to November thanks to the lack of modes in 15. 16 fixes that. I'll be playing this game all year. One thing that's brand new to the NHL franchise this year is the on-ice trainer. If you have the tool flipped on, contextual button prompts will pop up while playing the game across all modes. Essentially, depending on your skill level, the trainer will tell you how and when to pull a loose puck deke, toe drag, saucer pass, pin to the boards and slap shot. A button prompt with the action name appears above your selected player's head. If you perform the move correctly, you'll see a check mark indicating good play. It works the other way, too. Get too liberal with those one handed dekes and turnover the puck in the offensive zone, and you'll get a glaring red warning above your player. The same goes for moving offsides, firing a shot into a player's chest and more. This training tool really works well in conjunction with the Be A Pro mode. Your coach will grade you in places like offense, defense and team play. You'll need to use specific gameplay tools to excel in these areas. Maybe, say, you'll need to properly execute a stick lift. The game teaches you how to do that, and the coach rewards you when it's done successfully. Now, the good thing about that is that the stick lift is actually an incredibly useful tool in NHL. The on-ice trainer teaches you things that you should totally be using in play; it's not just a series of tutorial checklists that can be ignored after they're done. I do wish the game got a bit more detailed in regards to actual hockey strategy. It's great to know when to lift the opponent's stick, but what about managing gap, when to play dump and chase and when to pass into the slot. The trainer lags in this regard. It teaches you how to play EA's brand of hockey, but it never comes close to teaching the fundamentals of the real life sport. Which, I suppose, is fine. If you're looking to the on-ice trainer to teach you the nitty gritty of the game of hockey, that won't happen. If you don't know how to perform a loose puck deke? This has you covered. My only complaint is that, thanks largely to how strong Madden NFL 16 is this year, NHL 16's extra modes feel a little sparse. Take HUT, for example. Madden's Ultimate Team features a new way to earn cards. You can play a whole new mode called Draft Champions. You build a team through a 16 round draft and then play three games with that team. How well you do translates to free card packs for your Ultimate Team. There's no such system in NHL 16. The Madden team managed to build in modes like Draft Champions, the Gauntlet and the Gatorade Skills Trainer that breaks football down into tiny, easily digested components that work to make the game itself more addictive. NHL 16 doesn't have that feeling, and it feels a little thing by comparison simple for missing out on all the extra stuff. If I had one request for the NHL development team, it would be to zoom out and create some fun minigames like what we have with Madden. Let us earn HUT cards by playing in skill competitions, which the NHL has some of the best of, and I guarantee we'll be addicted. NHL 16 is such a better effort than it was last year. The inclusion of missing modes, improvement upon gameplay and better attention paid to arena feel make it a great year to play. I'm relieved, quite frankly. Relieved that NHL 16 is actually solid. I'm a diehard hockey fan. Like so many others out there, I watch as much as I can on a daily basis, regardless of who's playing. The sport is a huge part of my life. NHL 15 was downright disappointing. This franchise that I'd come to love playing every single year felt like a far cry from what it should have been. NHL is back, and I'm pleased that the game we have today is in such better shape. Is it perfect? No, absolutely not. It is, however, strong enough to keep players playing past November. Thank goodness for that. Disclaimer: We received a retail copy of NHL 16 for the PlayStation 4 from EA. We played the game over all modes for more than a week before starting this review.